I'm sorry Daniel I must have inadvertantly overlooked your sourcing in your initial posts. 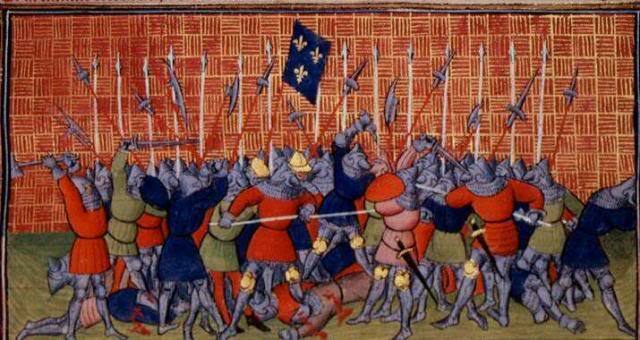 I have no idea how difficult 15th century additions of Froissart are to come by but I'll check. For the more modern stuff I was hoping for a reference to a specific book or article but the names of the authors will do I'll see what I can find. It's a bit of a disappointment to me that Waldman would myopically focus on what the Swiss were doing especially since he never states that as far as I recall, but I'll be happy to find some research that would reinstate the pollaxe as a battlefield weapon. If the book has a lot of good picts of Polearms it should be worth it just for that. Yep, it's always chancy basing your opinions on a single source. I'm happy to look at others though. I'll be posting my conclusions here once I've done the research. I had to give back my copy to library this morning, but I'm rather sure I remember Waldman stating his Swiss focus in the introduction or one of the earlier chapters. "The arms that will be discussed most fully , are those used by the Swiss..."
It was in the introduction which I'll have to admit that I skipped in my first reading. Sigh... I hate being wrong. At the same time nobody goes out and says: " Today I'm going out and make some mistakes so that I can learn something "
Hummmmmmmm, maybe that book is pretty good after all in the contexts of Swiss Polearms. I was in a bit of a hurry so I only wrote the authors names, these are books I've mainly relied on but as always I've bit up bits and pieces in many places so some are probably omitted. Andrew Boardman: "The Medieval soldier in the Wars of the Roses"
David Edge and John Paddock: "Arms and Armour of the medieval Knight"
Ian Heath: "Armies of the Middle Ages Vol 1&2"
Paul Knight: "Henry V and the conquest of France 1416-1453"
Malcolm Vale: "War and Chivalry"
Christopher Gravett, multiple works, notably his books on the battles of Towton and Tewkesbury and his book on English knights 1400-1500. 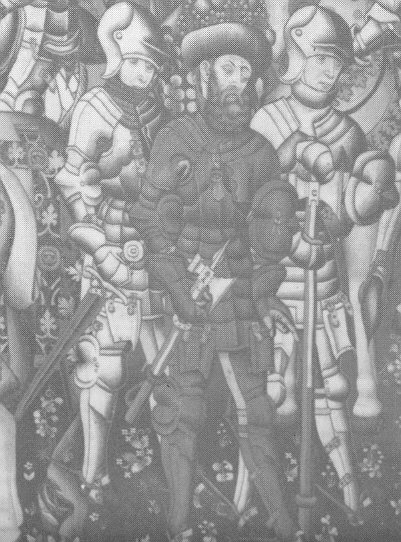 Gerry Embleton and John Howe: "The Medieval Soldier"
I've attached scans of details from the Burgundian tapestries captured by the Swiss during the 1476-1477 war with Charles the Bold, Duke of Burgundy. 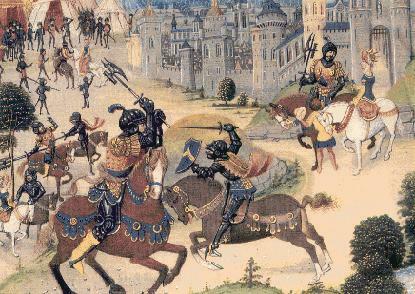 The tapestries are today kept in Bern and there is strong evidence that some of them (the so called Caesar tapestries) were made for Duke Charles himself. 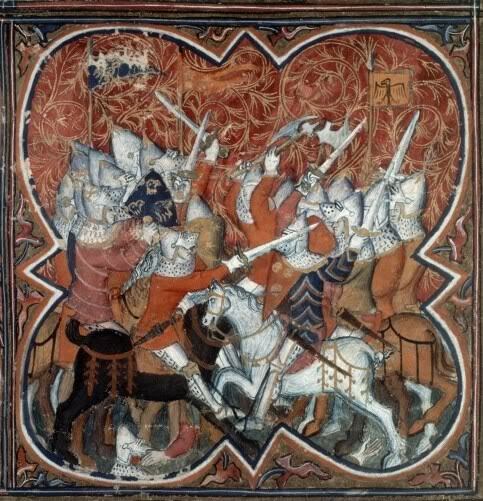 While there are elements of 'fantasy' in the arms and armour shown much is clearly based of real items and it has been suggested that many of the figures were actually based on the men-at-arms and archers of Charles Ducal Guard. 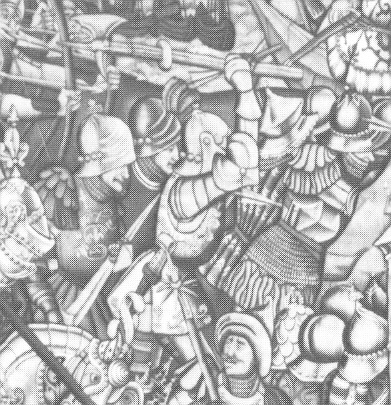 Pollaxe in the Caesar tapestry shows a man-at-arms in full armour wielding a shorter pollaxe, behind him another man-at-arms is amred with a what appears to be broad bladed type XVa with a type 8 guard(?) gripped in a half-swording stance. 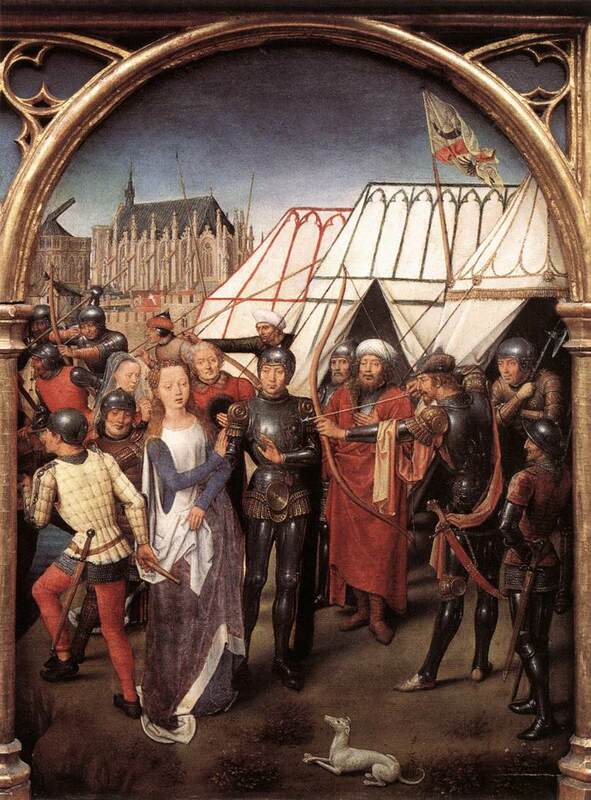 "Pollaxes in the Trajan tapestry" is a part from a tapestry showing the Emperor Trajan dispensing military justice, Trajan is portrayed in blackened armour and is armed with a short pollaxe while one of the men-at-arms guarding him has a long pollaxe. The lenght of this weapon would support Waldman's claim of a length of 5 feet. A big thank you for those great Picts. 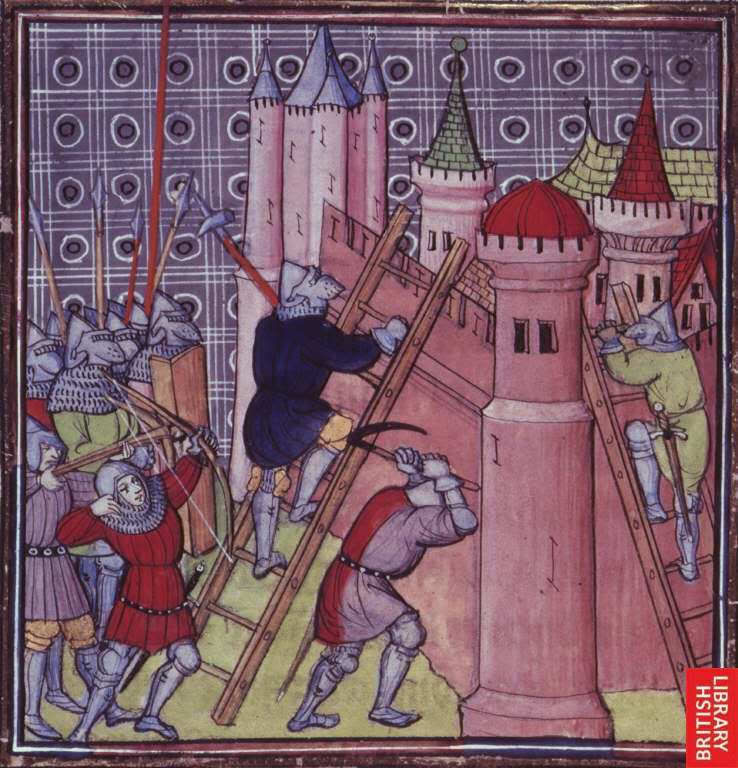 I think my basic question is answered about Pollaxes ( Correcting my spelling from Poleaxe: Are both O.K. ? I use 'pollaxe' as this seems to be the original with the 'poll' a reference to the hammerhead or spike fitted opposite the axeblade. AFAIk 'polearms' get their name from the long poles they are mounted on so the 'polearms' spelling is correct. 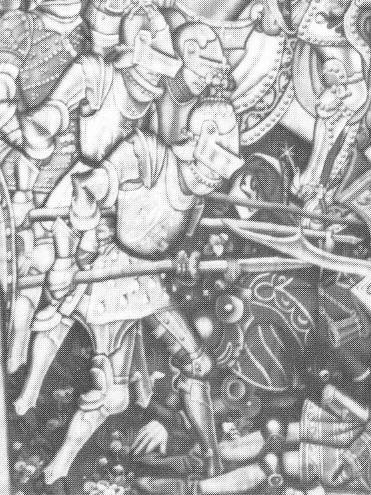 I've uploaded a few more images, the first two are men-at-arms portrayed in the Grandes Chroniques de France de St Denis dated to the end of the 14th Century while the last is an depction of the battle of Poitiers from the early 15th Century. 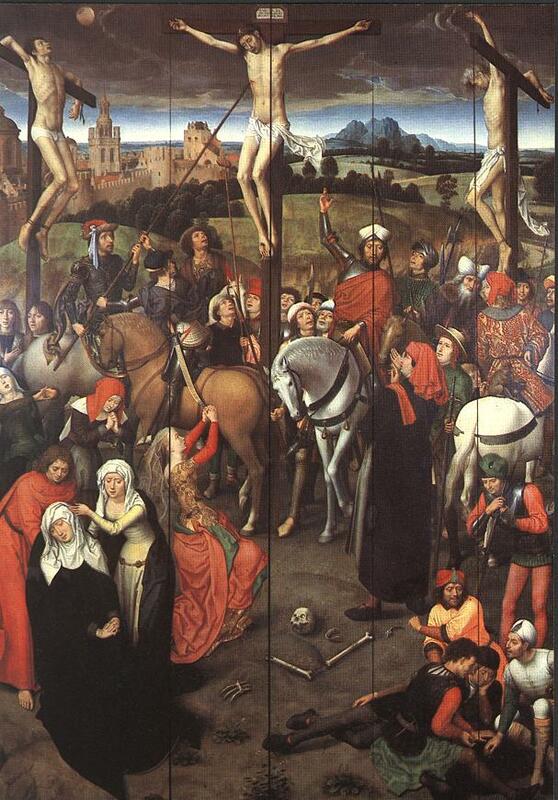 Note such details as the shortend, 5 foot lances and what might be early forms of pollaxes in the last picture. LOL alright already! 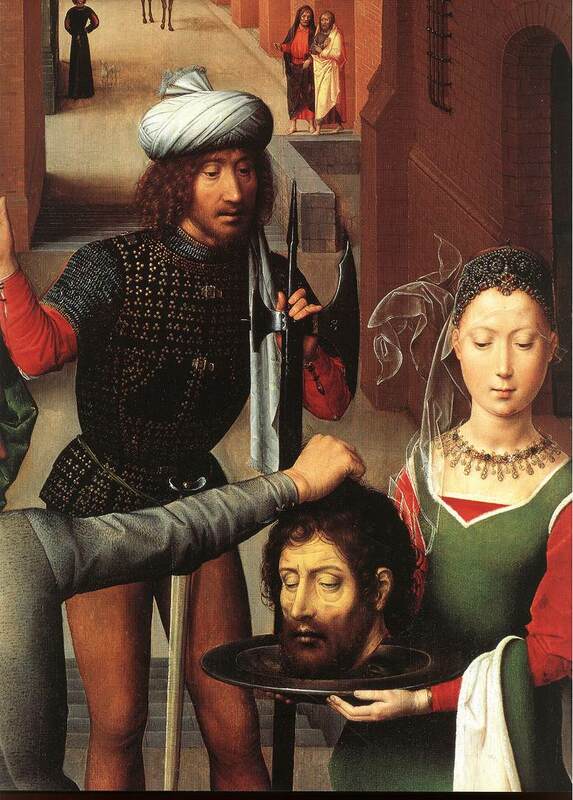 Thanks for the scans Daniel, if cudgelled over the head enough (perhaps someone needs to use a pollaxe) I can be made to see the error of my ways. Interestingly Waldman's book actually includes two of the first three pictures you posted there but he still for some reason draws those conclussions. I'm at a loss as to why he would do that. Anyway in view of the preponderance of the evidence you have submitted I've amended the review. However I would like to thank you for the titles that I can buy to do more research into this fascinating subject. 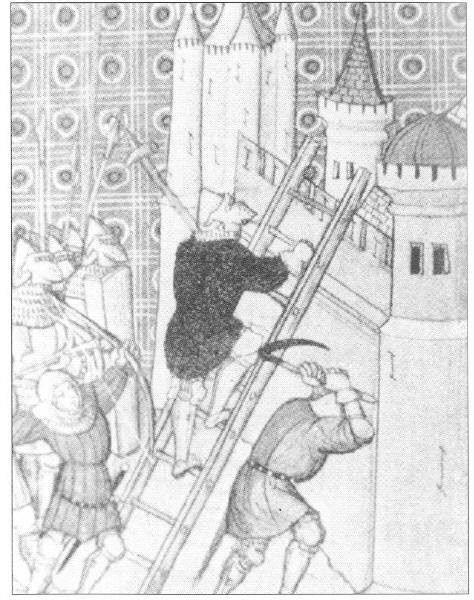 Just to further confuse things, there is an image of mounted pollaxe use. This is from a romance, so it could be a purely fictional usage, but it does mean that someone thought about the possibility of using a pollaxe on horseback. When some one says pole axe I can only think of the halberd in my mind this weapon has an advantage in most fights. it has reach and heavy axe head and a hook on the back to trip plus a spear tip to top the axe and hook off. I would gladly carry this weapon into battle. Dosn't mean Im right in doing so though. The weapons they said should be 8 feet and more, in my opinion, would be formation weapons....your either trying to hook a knight off his horse or keeping busy swinging away at the enemies poll formation....the poll axe and other 6 foot weapons would be used like a sergeants short weapon in a pike push....you got to be able to rush in and fill a gap or exploit a opening.....Plus I'll fight with a 6' weapon against a 9' any day....The control you have over a 6' is tremendous.....even 71/2 ' s are slow to react in comparison. imagine a knight in armor much superior to the typical grunt ...The grunts best chance is to stand by his bros and keep hacking away....A for effort, but a C for style....The knight is going to try to bust into them like a terrier in a rat pit...His best chances are to go in and keep going, cause as much havoc and ruin until the men at arms are soiling themselves...All the while looking for another rich SOB who he can knock the hell out and get some sweet,sweet, ransom. The axe lends itself to this. It has a hook and a sufficient thrust(Kern axe style or just a few pounds of steel smashing like today's cops little battering rams) But not a lot to get hung up while he is in the thick of things. On a side note , maybe this is why the Flemish did so well with their gudendag(sp?) They basically armed the guys WHO WERE SUPPOSED TO MILL AROUND TOGETHER with weapons that you have to run amok with for them to be effective. I'm not sure that we can describe the use of the godendag as "running amok." 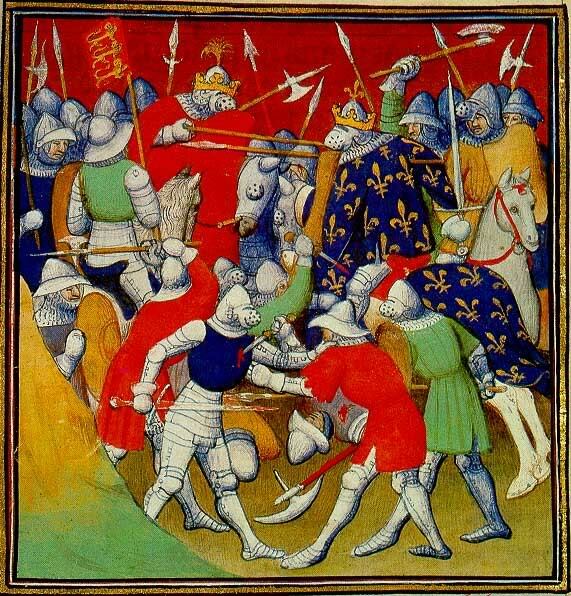 They seemed to have been specialist weapons used by picked groups of men who finished off enemies who had been wounded and/or knocked down by the spearmen/pikemen that made up the bulk of the Flemish battle-line, which means they were probably too disciplined and their battlefield actions too well-organized for them to properly "run amok." Nice job of showing the flaws in my theory ... I was thinking less "men at arms" and more city militia or other less trained quasi professionals.. And from that point of view.... troops not quite trained as well as a condotorri or field units...armor good, but not great,,,,,These are the troops who,in my opinion, would get issued long arms and would fight the way I was describing. 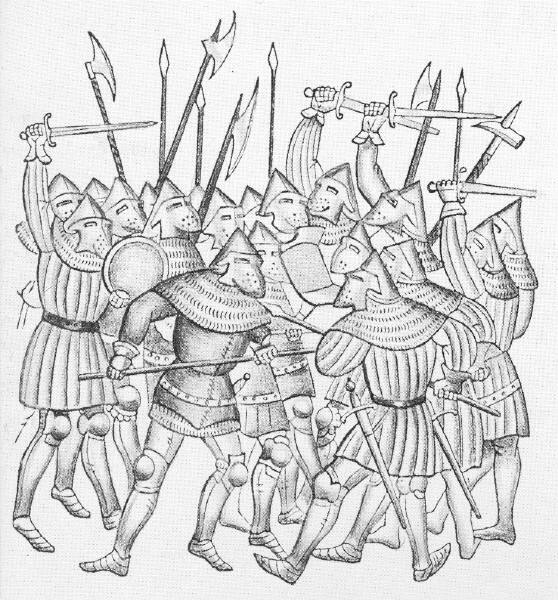 If you do not have cav scaring them into a rout rhen it would be the heavily armored men at arms led by their captain and/or a knight armed with shorter poll arms and great axes and longswords going in to decimate them. As for the "running amok" phrase......I was meaning the men armed with the gudandags would be showing more initiative and would be more on the offensive then what city militia would normally do. Hello I just got a wooden pollaxe for training. Now I would like to get some input on which resources to use. Is there some mor for the interested ones to get started with that awsome weapon? The best source to start with is probably the Burgundian "Jeu de la Hache"
Hans Talhoffer also shows pollaxe work; and so does Paulus Kal. And there are still a few more sources (e.g. Codex Vindobonensis B 11093). How at place and day assigned, resorting thither all the country, Sir Pandolf entered the place, nine spears before him. 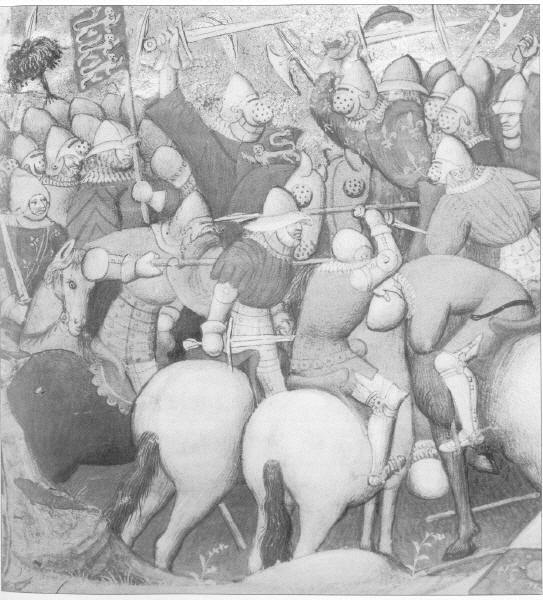 Then, the act of spears to the earl Richard worshipfully finished, after went they together with axes, and if the lord Galeot had not the sooner cried peace, Sir Pandolf, sore wounded on the left shoulder, had been utterly slain in the field. First, to enter the lists on foot, each armed as seems best to them, having their dagger and sword upon their body as they wish, and having a pollaxe of such length as I shall give. These arms were to be done on foot for a number of strokes; that is to say twelve strokes with the axe, twelve strokes with the sword and twelve strokes with the dagger.